Suitable fungal biomass might be obtained cheaply or perhaps even freely to offer a sustainable and environmentally sound method for harvesting microalgae. The potential uses of microalgae include burning their biomass as fuel or turning them into mini-factories for making biodiesel or specific chemicals including lipids, sugars or drugs. "The lack of an economic and effective method for harvesting microalgae is one of the bottlenecks limiting their commercial use in biotechnology," explains Mahabubur Talukder of the A*STAR Institute of Chemical and Engineering Sciences. 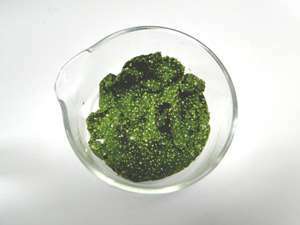 Microalgae can be cultured in a broth and existing methods for harvesting them include centrifugation or a precipitation process called flocculation using chemical treatments. All current methods however suffer significant drawbacks, explains Talukder. For instance, centrifugation is too expensive to be used for low value uses of microalgae, such as biofuel. Similarly inadequate, chemical flocculation contaminates the harvested microalgae with toxic metal salts, causing difficulties in further processing or extraction of desired products. The A*STAR team knew that less toxic natural materials such as starch could be used to precipitate and collect some freshwater microalgae, but this is not suitable for marine microalgae due to undesirable effects of the salty solutions. What is needed is a non-toxic and preferably natural and widely available material that can bind to, immobilize and precipitate both freshwater and marine microalgae. This led the researchers to investigate fungal mycelium, which they found was not only effective but could also add value by contributing to the total biomass in the combined and harvested material. The team screened several varieties of fungi with varying results, in some cases achieving a harvesting efficiency of 97 per cent after several hours of mechanical mixing with four times the mass of wet mycelium. Detailed analysis indicated that the key to the binding and immobilizing effect is a simple ionic attraction between the differing electric charges on the surface of the microalgae and the fungal mycelium. "The next step is to find a collaborator or industrial partner willing to invest in and further explore the invention and commercialize it," says Talukder, as his focus turns from the laboratory toward the challenges of scale-up and industrial production.